SocialEngine PHP – Build your own unique social network! Interesting looking white label social network software. Google Blogoscoped post on doing interesting stuff on FriendFeed. Picked this up on Friendfeed itself before checking my RSS. Hmmm. Interesting – Google at no point mentioned the word wiki with regard to Google Sites, even though that’s exactly what it is. Today at Wikia we have released our social networking features for MediaWiki under the GNU GPL 2.0. The best place to see this running live is at Halopedia, our Halo site. I am excited about all the stuff going on in this space. With google’s open social initiative, our work in social search and social networking for mediawiki, I think the whole wiki/free culture space is about to get a whole lot more interesting. Cool. Will have to track down where I can get this from and have a play. Might be useful for GovHack? Edit: I can’t find it anywhere. Help? Finally Google has finished making the JotSpot wiki service their own, and have relaunched it as Google Sites. This is great news, as a wiki solution is something that has been sorely missing from Google’s line-up of services for some time. Google Sites looks absolutely nothing like Jotspot, other than the fact that both are hosted wikis. All of the structured data templates launched by Jotspot in July 2006 have been stripped out. Users now have a choice between just five basic templates – a standard wiki, a dashboard where google gadgets can be embedded, a blog-like template for announcements, a file cabinet for file uploads, and a page for lists of items. Instead of creating structured templates, users will now simply embed spreadsheets, presentations and word documents from Google Docs, as well as Google Calendars, YouTube Videos and Picasa Albums. At the moment though it looks like it is only available to people who use the Google Apps service, where you can have white label versions of various Google services with your own domain and branding. So you can’t start a Google Site wiki with your standard Google account, I don’t think. I use Google Apps to handle my email and calendar and stuff, and will be implementing a Google Site as soon as it appears on my dashboard, and will make it available for people to have a play. That’s my weekend sorted, then. This looks like a great job…for someone who’s bilingual. Laura Whitehead points to some interesting resources on making social media more accessible. These ‘Communities of Practice’ are an attempt, according to their creators, to harness the power of social networking to share problems, ideas and expertise. A predictable reaction possibly. But in reality, it isn’t a closed shop. Just by connecting all those in local government alone there would be a huge number of different voices and perspectives involved. But there are also people from across the public sector, not to mention Councillors and people who work for the sector as independent consultants. It would be interesting to find out what would happen if Joe Public tried to join. I suspect they would be engaged with and not turned away. How interested are folk in the minutiae of local government working practices? Maybe there should be something similar created to connect people with an interest in local politics, to help them work together and engage with their local authorities. …except for the fact that this is funded by the long-suffering taxpayer. Remember that those that govern despise the governed and resent any intrusion into their cosy unproductive world. There is no need to cut essential services to fund tax cuts – there are hundreds of millions to be saved by abolishing these glorified social clubs. Sigh. There’s actually a multitude of examples of where this technology has saved money – travel can be avoided by collaborating online, for example. But this sort of vile attitude towards public servants probably isn’t worth even spending the time to argue with. I’m the (or rather now, ‘a’, but more on that later) facilitator at an online community of practice for social media and online collaboration using the Communities of Practice platform put together by Steve Dale at the Improvement and Development Agency. It’s ostensibly for local government, but I like to operate a big tent, and so anyone with a public sector interest can come along. Yesterday we ran our first face-to-face meeting ludicrously entitled the ‘Big Day Out’. 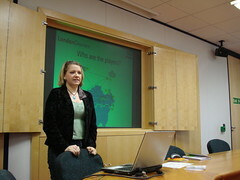 Given that it was held where I work, at the LSC National Office in Coventry, it wasn’t much of a day out for me, but hey! who cares. I took a few photos, some of which are below, the rest here. We then moved onto more interesting stuff, notably chats from Hadley Beeman and Shane McCracken on what they have been up to recently. Later on we played a little game, a cut-down version of David Wilcox‘s Social Media Game – although as Tim Davies pointed out mine is best overall because the cards are laminated. 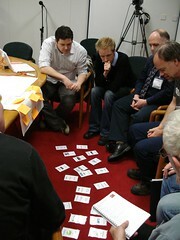 Two teams set each other scenarios which they had to solve using different social media and web 2.0 tools. I think it was a useful exercise as everyone got to learn something about a web service they didn’t know existed before. Next up was Steve Dale, chatting to us about the latest developments tech-wise on the CoP platform. There’s going to be some really interesting new features added, which will at the very least make facilitating the communities an awful lot easier. Finally we had a little chat about the future of the Community, what we could do to improve participation and what we got out of it all. Michael Norton of the IDeA had a wicked-cool idea about setting group social media challenges, making us go out and try new stuff, and reporting back on our findings. One is already under way on YouTube. Nice one! Throughout the day, the ever resourceful Carl Letman was doing a great job of videoing some of the action, and soon I should be able to post some highlights up here. If you need any video work doing, whether on or offline, Carl really is your man. I also requested a bit of help of the facilitation side, and thankfully I got a great response from Michael, Hadley, Steve and Carl. So hopefully we should be able to keep the Community active and ensure that everyone gets the support they need. What was also nice was that everyone said they would like to do it again. Hopefully if the word gets out that it was a fun day, then more folk might be encouraged to come along. Noel Hatch of Kent County Council has already offered to host, and suggested we could run it virtually in parallel using Second Life. He’s mad. Let’s do it. FriendFeed is an interesting service, which I was alerted to by Neville Hobson. It enables you to create a ‘lifestream’ – a list of all your interactions with various social networking sites. It create a narrative list of, for example, tweets, blog posts, flickr postings, youtube videos, del.icio.us links etc etc. As an example, here’s mine (please be my friend). You can also choose to subscribe to other people’s feeds, which is presented on the friendfeed homepage in a Twitter stylee, or you can click to view the entire FriendFeed universe in a river of news type affair. FriendFeed is useful, there’s no denying that. The splitting of our online personalities is well due for a reassembling, and FriendFeed makes a pretty good stab at doing that with an interesting social element to it as well. I do wonder how much services like this, and Twitter, are drawing us away from our RSS readers and back to using actual websites on a regular basis. I find myself less reliant on RSS, getting the key ‘must read’ updates through other means these days. Not that I am reporting the death of the aggregator, of course, merely that it’s slightly less dominant these days, for me at least. I also think there might be some really useful applications of this, especially if it becomes possible to extract stuff from the public timeline along the lines of subject matter, maybe through tagging or just identifying keywords, rather than just by identity as it is done now. Oh, and Scoble‘s in now. So it’s going to be huge. Social networking can help public sector bodies interact to a far greater extent with citizens as well as with internal and external resources. 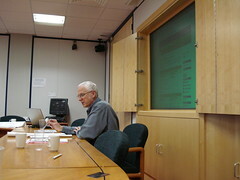 Full policies are required to be put in place to mediate social networking, and back-end technology needs to be chosen carefully to include support for the majority of clients likely to be found within a consumer-focused end-user environment, as well as kiosks and other systems aimed at the non-computer owning citizen. Usig web technology presents a huge opportunity to engage with people on a scale that wasn’t possible before. But we do have to acknowledge that it can only ever be a part of a consultation strategy. Too many people don’t have web access, or don’t want to engage with that medium, for more old-school methods to be ignored. Cool Twitter search engine. Better than mine, anyway.